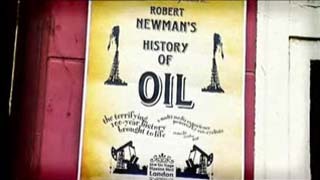 Robert Newman is a British comedian who presents the twentieth century history of oil in a most enlightening way. The video is 45 minutes long and covers topics such as Resource wars, Middle East democracy, the invasion of Iraq, the Euro (versus US dollar) theory for the war in Iraq, Peak Oil, and food production. Robert Newman gets to grips with the wars and politics of the last hundred years — but rather than adhering to the history we were fed at school he places oil centre stage as the cause of all commotion. This innovative history programme is based around Robert Newmans stand-up act and supported by resourceful archive sequences and stills with satirical impersonations of historical figures from Mayan priests to Archduke Ferdinand. 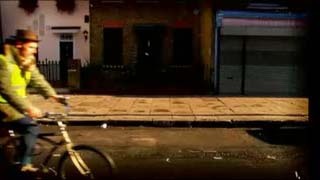 Quirky details such as a bicycle powered street lamp on the stage brings home the pertinent question of just how we are going to survive when the worlds oil supplies are finally exhausted.